Data collection for IOM Libya’s eighth Mobility Tracking report, was carried out from mid-January to mid-February across all baladiyas and muhallas (neighbourhoods) in the country. The report is the first to reflect DTM’s updated Mobility Tracking data collection methodology for 2017. To provide more context to internally displaced persons (IDP) and returnee needs and vulnerabilities, new baseline indicators have been added on health, education, livelihoods, nutrition, public services, security, and community relations between residents, IDPs and returnees. These aim to provide humanitarian partners with tools to flag and identify areas within the country that may require targeting of specific types of assistance or prioritize aid based on a more comprehensive vulnerability analysis. The largest number of IDPs identified continues to be in Benghazi with 38,400 IDPs reported during this round. Other baladiyas hosting large numbers of IDPs are Abusliem, Bani Waleed, Ejdabia and Misrata. IDP relations with residents in baladiyas were reported to be good or excellent, and in 17 per cent of baladiyas the presence of IDPs was reported to have a positive impact on the local labour market in terms of generating greater economic activity. IDPs’ main reported sources of income were public employment, small business or trading, or aid from NGOs or the government. Eighty-six per cent of identified IDPs resided in private accommodation, 87 per cent of whom were in self-paid rented accommodation. Sixty-seven per cent of returnees identified during this round were in the baladiya of Benghazi. Ubari, Abu Qurayn and Kikkla also had large numbers of returnees over the course of 2016. Around 92 per cent of returnees had gone back to their homes upon returning to their baladiya of origin during 2016, while nearly 4 per cent returning to new homes and 4 per cent were hosted by relatives at the time of reporting. Generally, returnees were reported to have good relations with the community in their baladiya of return, with poor relations and a negative impact on the labour market being reported in only 4 per cent of baladiyas. Returnees appeared to have a negative impact on public services in 18 per cent of baladiyas to which they returned. The main source of income for returnees was reported to be public employment, followed by farming and aid. The report presents key facts and figures from the data gathered; however, the full dataset is available on the DTM website to facilitate more in-depth analysis of displacement data and trends. 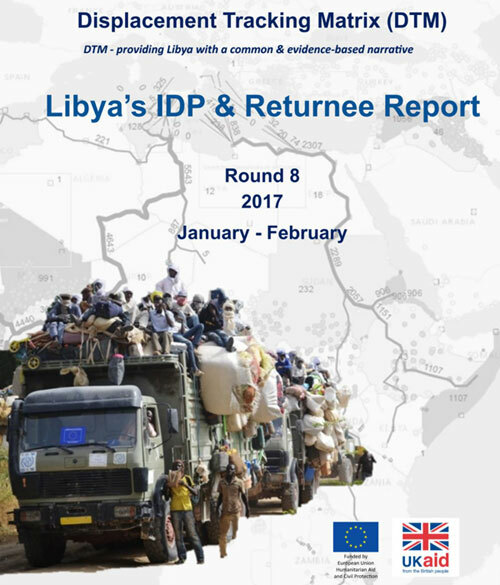 “DTM Reports provide Libya with common and evidence-driven narratives, ensuring that there is no information gap on any part of Libya,” said IOM Libya’s DTM programme coordinator, Dan Salmon. DTM’s Mobility Tracking module provides regular updates to Libya’s baseline on IDPs, returnees and migrants in the country. DTM also publishes data on migrant flows in Libya through its Flow Monitoring statistical and survey analysis reports and provides bi-weekly updates on displacement-related incidents through its Displacement Event Tracker.